There are thousands of different types of locks available on the market today. From doorknobs and car locks to fingerprint controlled systems. All of our locksmiths are fully capable of changing or repairing any type of lock you may have. Beside our online specials and friendly service. We provide written warranty for all the parts and Seattle locks change services were provided by Sevan Locksmith. Call us at (206) 274-7061 today. Do your locks work properly? Do you have a broken lock that is causing security issues in your home, business, or vehicle? When a lock breaks, it can cause the door to not close properly or be unable to be locked, which in turn causes your home to be vulnerable to invasion. A lock that is in proper working order will be able to lock and unlock with ease without causing any problems. If your lock seems stuck, loose, or is otherwise not working in a good manner, it may need to be replaced. Our emergency Seattle locks change services available day and night 7 days a week to make sure your property is safe and secure. Doorknobs are one of the most commonly installed type of lock available. While they are usually similar in appearance, their mechanisms can be quite different, resulting in many parts that could come loose or break from overuse. This can cause the lock inside to become worn, cracked, or loose, which would cause the lock to not work properly. Whether you have a regular round or a decorative doorknob, we can replace it on the spot. Deadbolts come in many different levels of security, style, and colors. These are your doors’ main security feature, and they come with a strike plate that is drilled into the door frame which helps prevent the door from being kicked in or shimmied. Whether you have a basic or high security deadbolt, our Seattle locks change team can repair and replace it on the spot. High security locks include Mul-T locks, access control systems, panic bars, and any other type of lock that has a higher level of security than a basic deadbolt and doorknob. These types of locks are less common, but they will often need to be repaired after a few years of use. We can install, repair and replace these any brand of high security lock on the spot. 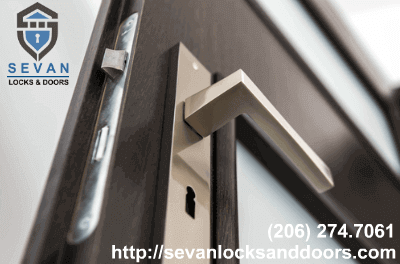 Call Sevan Locksmith now for free consultation and estimate (206)274-7061. Our Seattle locks change team is fully capable of repairing and replacing any type of lock you may have, whether it is a basic lock, high security lock, or access control system. Because we are mobile, we carry everything needed to quickly and efficiently get your locks change service done in no time. Sevan Locksmith is licensed and bonded to provide you with the best service possible. All work is completed by a local, in-house employee. We never hire your service out to another company, and any work to be done will be written on an invoice before the locksmith begins your services. This is to ensure the safety and privacy of your home and business, as well as give you the peace of mind knowing you’re in good hands.We constantly train our locksmiths on the most up to date techniques and procedures to make sure we stay on top of the highest levels of security available to give all of our customers the best service possible.